I was at a riotous dinner on Saturday with C&A and some of their unusual friends, and the topic of expats came up. My personal definition of an expat is someone living in a foreign country who derives his/her income from the home country and pays taxes there too. They are either retired or temporarily resident. 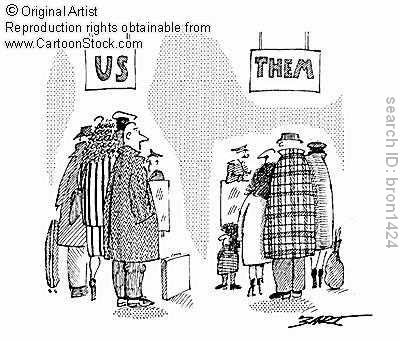 Everyone else is an immigrant. There was some difference of opinion at dinner so I thought I'd look it up. The Oxford dictionary defines an expatriate as some 'who lives outside their native country' and an immigrant is a person who 'comes to live permanently in a foreign country'. There seems to be a notion of movement with immigrants, the act of immigration, so does one become an expatriate from an immigrant? To all intents and purposes, the terms are interchangeable. The OECD's paper on Counting Immigrants and Expatriates in OECD Countries defines expatriates as anyone living in a foreign country regardless of the duration. Funny how you never hear anyone refer to 'second-generation expats' however. Brits who move to France often congregate in an expat community. Young couples who do this and have children produce the next generation. How are those children referred to? If they were a Pakistani couple who moved to the UK, their children would be referred to as second-generation immigrants. Rather unpleasantly, there is an unofficial sub-definition suggesting that expats come from rich countries and move to another from choice, while immigrants are forced to move to escape poverty in a poor country in their search for a better life. Proof of this can be seen with the kids. Expats' kids become residents/citizens, immigrants' kids remain labelled as immigrants however they consider themselves. Another difference is that expats who congregate live in a 'community'. Would you ever think of an expat 'ghetto'? Ghettos are defined as areas, especially slum areas, in a city inhabited by a minority group. Although Pezenas has no slums, it is heavily populated by Brits. Does this make it a British ghetto, or does it just have a large British expat community? The term expat is usually considered positively while 'immigrant' is often derogatory. Yet, officially, they are the same thing. How the terms change in meaning depends on how we project our prejudices onto each word. Personally, I wouldn't be seen dead joining an expat community. I enjoy having British friends, but I'm not interested in living solely amongst my own kind in a foreign land. There is a lot of back-biting, bitchiness, infidelity, and so on, which can be seen from afar on online local expat forums. Helen Stevenson, who wrote 'Instructions for Visitors' was a member of such a community down towards Perpignan, and was more than happy to leave it when she divorced her British husband. How do I consider myself? Not as an expat, that's for sure. I emigrated to France to be with my future (ex-) French husband. Now divorced, I still live, work and pay my taxes in France. I have French children who are schooled in French schools. I did not, however, take a French passport because I'm not French and have no desire to slap a false identity onto my sense of self. Will I stay here forever? No idea, but I have no particular desire to return to the UK. Which, I suppose, makes me a foreign national expatriate immigrant. Voila. I think it's purely a question of citizenship. When you acquire it, you cease being an expat and start being an immigrant. Only the Japanese, I think, have created words describing succeeding immigrant generations: Issei, Nisei, and Sansei in descending order. But what about Europeans in Europe who don't need citizenship cos we're one big happy family?